A team of scientists from Michigan Technological University have definitively linked the algae problem plaguing the Ajax waterfront for years to the Duffin Creek Water Pollution Control Plant (WPCP). The Michigan Tech team, led by Dr. Martin Auer, undertook field and laboratory studies in relation to the Ajax waterfront over the spring and summer of 2014, and outlined their results and conclusions in a new report titled: Phosphorus Provenance and Cladophora Growth in Lake Ontario. from Ajax waterfront on Sept. 11, 2014. The new report has been sent directly to the Minister of the Environment and Climate Change, Ajax-Pickering MPP Joe Dickson and the Regions. The Duffin Creek WPCP discharge creates a plume of nutrient enriched water within the area of the nearshore where algae growth occurs. 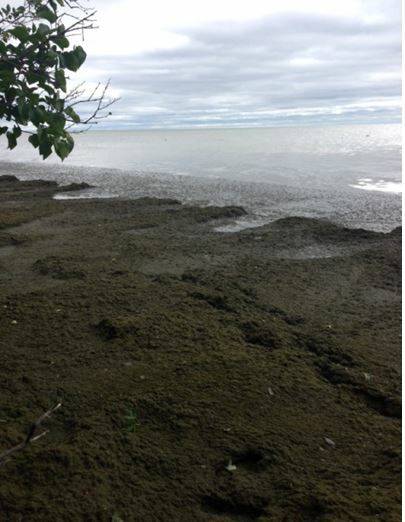 The offshore waters of Lake Ontario do not contain nutrients at levels capable of causing nuisance-level growth of algae in the Ajax nearshore. Algae samples taken across the Pickering-Ajax nearshore indicate that algae in the vicinity of the Duffin Creek WPCP outfall is being exposed to more growth stimulating nutrients than elsewhere in the area. This pattern indicates that the Duffin Creek WPCP discharge is feeding the algae with nutrients and causing excessive growth. 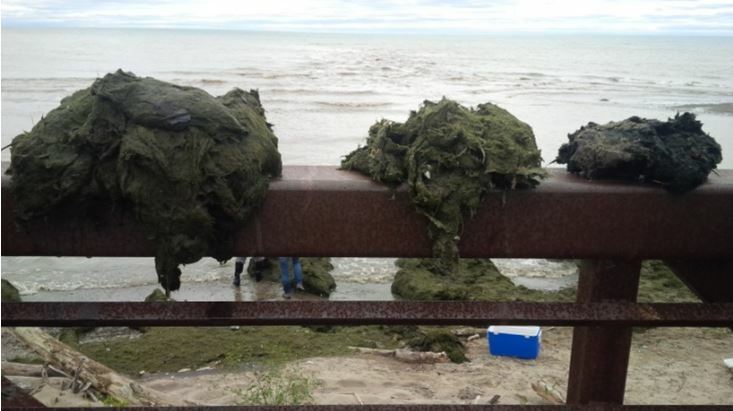 Algae samples from Ajax waterfront on Sept. 11, 2014. The Town commissioned the Michigan Technological University team to conduct the 2014 spring and summer field and laboratory studies. Further modeling and field work is currently being undertaken by the Michigan Tech team to develop possible management strategies to restore the Ajax waterfront. This work is expected to be completed and released in early 2015. The findings will assist the Town in ensuring the best possible method of stopping the release of phosphorus that feeds algae growth is implemented. To read the full Phosphorus Provenance and Cladophora Growth in Lake Ontario, visit www.ajax.ca/wpcp. In February 2014, the Town submitted a Part II Order request to the Minister of the Environment and Climate Change in relation to the Regions of York and Durham’s Schedule C Class Environmental Assessment to Address Outfall Capacity Limitations at the Duffin Creek Water Pollution Control Plant. The Town’s request called on the Minister to order a full Environmental Assessment. The algae-plagued Ajax waterfront, Sept. 2014. Christie McLardie, Manager of Communications, Town of Ajax, 905-999-8254.